Stumped for a different Christmas idea? Why not consider one of Harrod’s wide range of Christmas hampers chock full of treats and culinary delicacies. Hampers are like several presents all in one basket, each one more mouthwatering than the other, and they make a welcome change from the usual mundane gifts,and an entire family can indulge in a cornucopia of gourmet food and sparkling wines from a gift basket. Harrod’s offers eight different lines with a numerous selection of hampers to choose from with prices ranging from under £50 to over £2000 and up to a staggering £20,000 for the limited edition Decadence hamper. This super hamper contains 25 bottles between fine wines and champagne, cavier, salmon, foie gras with truffles, cheeses, delicious Italian and Spanish hams and cold cuts, a 9,5 kg Christmas cake and the highly exclusive Kopi Luwak coffee, which is collected from the dung of Asian palm civet cats after they have been fed a diet of coffee berries. Since most people are on a tight budget we’ll just take a look at some of the Christmas hampers that cost under £50 and still make a delightful gift for anyone. 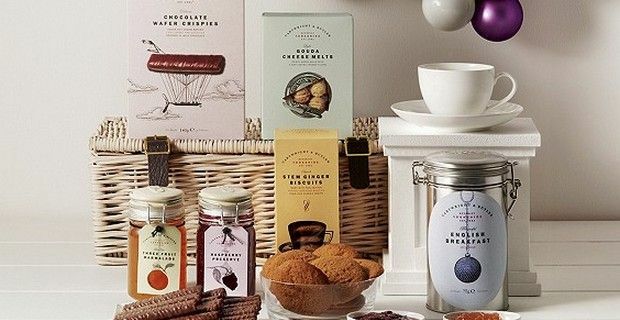 The Hemsley hamper is named after the quaint market town of Helmsley in Yorkshire and filled with Cartwright and Butler products from the English breakfast tea to fruit-filled raspberry preserve and marmalade and also includes stem ginger biscuits, Gouda cheese melts and layered chocolate wafer crispies. If you know someone that has a sweet tooth, the Penny's Sweets collection is for them. It features halal sweets flavored with classic pudding flavors such as Bakewell tart, chocolate muffin, strawberry cheesecake and lemon meringue. Ultra romantic and refined is the champagne and chocolate box that contains a selection of milk-, white- and dark-chocolate pralines with a bottle of Harrods Premier Cru Champagne. For a truly seasonal choice there’s the Christmas Classic that holds a rich brandy butter made with Courvoisier VS Cognac and a fruited pudding with warming brandy.